AVID Jazz here presents three (and a half!) 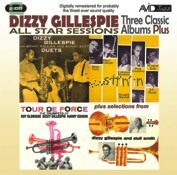 classic Dizzy Gillespie albums, including original LP liner notes on a finely re-mastered and low priced double CD. Dizzy Gillespie: with Sonny Rollins & Sonny Stitt: Duets, Tour De Force, Sittin In, plus selections from Dizzy Gillespie & Stuff Smith. The Sonnys were truly shining during December 1957 when this remarkable meeting of giants took place as Dizzy Gillspie met sax men Sonny Rollins and Sonny Stitt. The influence of the legendary altoist Charlie Parker hangs over these sessions as the two Sonnys join Dizzy in a series of truly accomplished Duets. Tour De Force finds Dizzy a little earlier in 1955 in the company of a couple of true jazz trumpet legends, Roy Eldridge and Harry Edison. Proving that these two giants, from what appeared to be another era some 15-20 years earlier still had what it takes, the sessions simply swing with a ferocious sense of energy and vitality. Again we march forward to 1957 for SittinIn where we find Dizzy this time in the company of more jazz greats Stan Getz, Coleman Hawkins and Paul Gonsalves for the first time this quartet had recorded together. We conclude our Dizzying round up with three sides from a 1957 session Dizzy cut with unique jazz violinist Stuff Smith, heavy stuff indeed! !